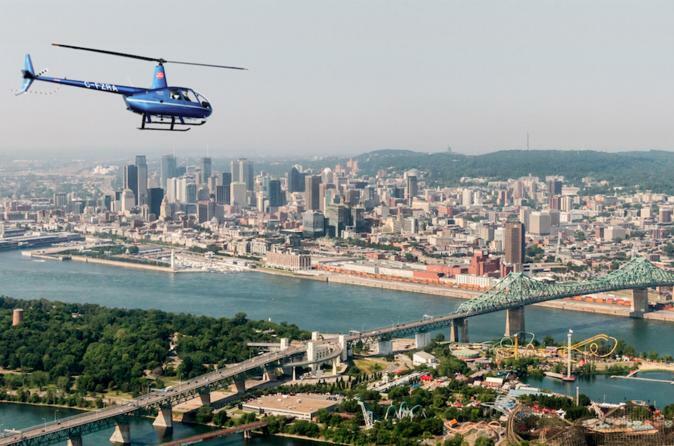 Discover Montreal as you've never seen before as you fly overhead in a helicopter. See the Olympic Stadium, Downtown Montreal, Mount Royal and more from the best perspective out there. Fly along the Saint-Laurent with a 30-minute ride to go over the Parc Jean Drapeau, and Jacques Cartier Bridge until the Boucherville Islands. Explore this beautiful city in a totally unique way in this unforgettable tour. The tour will start with quick safety-briefing from your pilot. Get to know the pilot, the aircraft, and feel comfortable before take off. When ready, and after a great photo opportunity in front of the helicopter, you'll take-off immediately and head through the skies to Montreal. During the ride, you'll discover the Quebec Capitol from the sky at the altitude of 1500ft. You'll fly over every monument and see all the best spots of the city from this totally unique perspective. See the Olympic Stadium, Downtown Montreal, and Mount Royal. The twenty minute ride will bring you back to the airport through the Old Port of Montreal and Victoria Bridge. If you go with the 30-minute ride, you'll fly along the Saint-Laurent to go over the Parc Jean Drapeau, and Jacques Cartier Bridge until the Boucherville Islands. Head over the countryside for views of beautiful landscape, and enjoy the natural splendors of Montreal. The photo opportunities on this flight are abundant and unforgettable. Sightseeing by helicopter is undoubtedly thrilling and luxury afforded to few, so take this opportunity to forgo a traditional city tour and see the city from the endless skies above.